Plains Zebra. Photo by Gerald and Buff Corsi, © 1999 California Academy of Sciences. "Odd-toed" or "odd-hoofed" mammals make up the Perissodactyla. Like the "even-toed" Artiodactyla, perissodactyls are unguligrades; that is, they walk on the terminal bones of the toes and have enlarged toenails forming hoofs. Unlike artiodactyls, perissodactyls either walk on three toes (like rhinos, tapirs, many extinct horses, and other extinct groups) or on a single toe (like recent horses). Only seventeen species of perissodactyls remain on the Earth today, a shadow of the group's former glory. Perissodactyls were once much more diverse, including the enormous horned brontotheres, the bizarre browsing, clawed chalicotheres, and the largest land mammal of all time, the Eocene Indricotherium (formerly known as Baluchitherium). It stood five meters (over sixteen feet) tall at the shoulder. 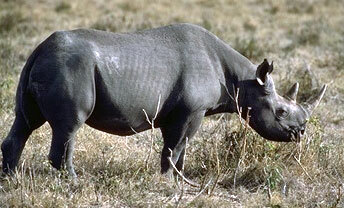 Black Rhinoceros. Photo by Gerald and Buff Corsi, © 1999 California Academy of Sciences. Most perissodactyl lineages went extinct in the late Eocene or Oligocene. Those that remain include the horses and zebras (Equidae; eight living species), rhinos (Rhinocerotidae; five living species), and tapirs (Tapiridae; four living species). Most of the species that remain  notably, all five living species of rhinoceros  are in danger of extinction; others, like the quagga, have already been driven to extinction. Fossil Horses in Cyberspace is a great on-line exhibit from the Florida Museum of Natural History. Or, for more information on the most familiar perissodactyl, visit the International Museum of the Horse. For information on ungulates, see DeerNet and The Ultimate Ungulate. 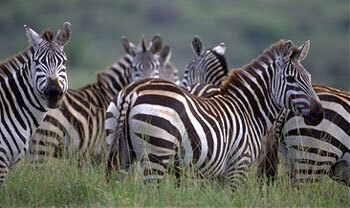 You might also be interested in the Zebra Home Page, the rhinoceros page from the U.S. Fish and Wildlife Service Endangered Species Program. The Tapir Gallery is also highly recommended, with images, information, and links that tell you almost anything you might want to know about tapirs.